Prognosis of chronic osteomyelitis depends heavily on proper identification and treatment of the bone-infecting organism. Current knowledge on selecting the best specimen for culture is confusing, and many consider that non-bone specimens are suitable to replace bone cultures. This paper compares the microbiology of non-bone specimens with bone cultures, taking the last as the diagnostic gold standard. Retrospective observational analysis of 50 patients with bacterial chronic osteomyelitis in a 750-bed University-based hospital. Concordance between both specimens for all etiologic agents was 28%, for Staphylococcus aureus 38%, and for organisms other than S. aureus 19%. The culture of non-bone specimens to identify the causative organisms in chronic osteomyelitis produced 52% false negatives and 36% false positives when compared against bone cultures. Diagnosis and therapy of chronic osteomyelitis cannot be guided by cultures of non-bone specimens because their microbiology is substantially different to the microbiology of the bone. Chronic osteomyelitis (COM) is a major medical problem in most countries, mainly associated with violent trauma and modern surgery. It is a very expensive disease for patient and society because of the involved costs of diagnosis, inpatient and outpatient treatment, rehabilitation, lost productivity, and sequelae . In the opinion of authorized clinicians, the term cure cannot be applied to COM, because "the bone infection may recur years after apparently successful treatment of the disease" . To minimize risk of recurrence, treatment must include thorough surgical debridement and precise antimicrobial therapy directed against the pathogen involved in the infection. Based on common sense and a single classical paper , appropriate cultures of bone specimens are considered the gold standard for conclusive microbiological diagnosis [2, 4, 5]. However, recent studies suggest that microorganisms isolated from non-bone specimens such as sinus tracts and superficial wounds are concordant with those found in bone specimens, and conclude that these samples are as good as the infected bone [6–8]. In consequence, orthopedic surgeons prefer non-bone to bone specimens to guide antimicrobial therapy in many instances of suspected COM, particularly after complicated reconstructive bone surgery. Although most experts [4, 5, 9] and new studies  keep emphasizing the importance of bone cultures as the diagnostic gold standard, these conflicting reports suggest the necessity of more and better data, because confusion may have been feeding further the no cure theory . Chronic and acute osteomyelitis related to trauma by high-speed bullets, bomb explosions and car accidents particularly affects Colombia, a developing country with an old internal conflict. Although reliable official statistics do not exist, prevalence might be illustrated by the fact that 10% of 1500 consults/year to the Infectious Diseases Section at our institution are caused by osteomyelitis. For the last four years, we have worked together with orthopedic surgeons in the management of osteomyelitis: besides proper surgical debridement-including excision of inert and foreign material- and obliteration of dead space left by such procedure, accurate identification and susceptibility pattern of the infecting organism in the bone are required elements to start antimicrobial therapy. This paper reports the findings of a retrospective cross-sectional observational analysis of 50 patients with confirmed COM who had cultures from bone and non-bone specimens. The aim of the study was to establish how often the microbiology of non-bone specimens was concordant with that of the diagnostic gold standard (culture of operative bone specimens). The study was conducted at Hospital Universitario San Vicente de Paul, a 750-bed, third level university-based hospital located in Medellín, Colombia. From February 1998 to August 2001 all charts from patients with confirmed COM recorded in the Infectious Diseases Section database were screened for inclusion and exclusion criteria. For clinical records and database entry purposes, COM had been defined since 1997 as a bone infection that was worst or had not improved after one month of evolution, independent of the presence or quality of surgical and antimicrobial therapy. This definition was selected because one month is 3 times the 10-day period necessary for bone necrosis after acute infection  and it allowed precise selection of patients from the database. To overcome the limitation imposed by the lack of bone histopathology demonstrating COM, each case was evaluated in search of the hallmark of chronicity, that is, bone necrosis, microorganisms infecting the bone, and compromised soft tissues surrounding the infected bone . Inclusion criteria allowed patients of any age and gender with COM as defined above, who had aerobic bacterial cultures from the infected bone and from any of the following non-bone specimens directly related to the infected bone: pus aspirated from surrounding soft tissues, soft tissues, surgical wounds, drainage from orifices left by orthopedic pins, and drainage from sinus tracts. Only four operative bone specimens were acceptable: bone biopsy, sequestrum, bone marrow, and aspirated subperiostic pus. It was also required that bone specimens had to be taken during surgery, and a clear note by the surgeon must establish if the incision was made through intact skin in opposition to infected soft tissues or sinus tracts. Non-bone specimens could be taken during surgery or in the ward, by needle aspiration, sterile swab, or soft tissues biopsy. Patients with COM secondary to diabetic foot or decubitus ulcers were excluded to allow the accurate use of bone cultures as the diagnostic gold standard. Patients records were screened for gender, age, potential mechanism of bacterial access to the bone, time of evolution of COM, bone involved, surgical access to take the bone specimen, origin of specimens cultured, genera and species of organisms identified, and antibiograms (Vitek Systems®, bioMerieux, Hazelwood, MO, USA). Absence or use of antibiotics in the 48-hour period before bone biopsy was recorded, as well as each antibiotic prescribed. Taking bone specimens as the gold standard against which non-bone specimens were compared, organisms isolated from these two different cultures in each patient were paralleled looking for concordance, first by genera and species, and then by antibiogram. Concordance was defined as the finding of exactly the same bacterial species with identical susceptibility pattern in both specimens. COM caused by Staphylococcus aureus were analyzed independently and combined with all other etiologies. Concordance of the specimens from monomicrobial and polymicrobial COM were analyzed in relation with the site of surgical access to the bone sampled (intact skin versus infected soft tissues). Also, sequestrum and bone cultures were analyzed independently and together, to check if the first were concordant more often than the second with non-bone specimens. Variables are presented as means with standard deviations, or percentages. Statistical significance of differences between groups was determined by Chi Square analysis with Yates correction when appropriate. The data management was done with Epi-Info 2000 (CDC, Atlanta, GA). Excluding diabetic foot infections, the Section of Infectious Diseases attended 158 consults for COM during the study period (38 months). One hundred-four patients lacked non-bone cultures and / or acceptable operative notes, and 4 had COM associated with decubitus ulcers. The other 50 patients met the inclusion criteria; their demographic data are detailed in Table 1. In summary, 90% were males 36 ± 16 years old that had COM evolving from 1 to 432 months (median 3, mean 17 ± 61 months). Violent or surgical trauma preceded bone infection in 84% of patients. Femur, tibia, and fibula comprised 84% of the bones infected. Only three patients had bone histopathology reports -all confirming COM-, but the hallmark of chronicity was confirmed in all patients: 100% had infected bone, infected soft tissues, and radiological signs of osteomyelitis because all were required for inclusion, although not necessarily sequestra. Bone necrosis was established with that wording in the surgeon's operative note of 22 patients and by the description of sequestra in other 27 (x-rays, drainage of sinus tracts, or the surgeon's note). Only one patient did not have direct evidence of dead bone, but he had one month of documented infection of the right tibia by Pseudomonas aeruginosa. Demographic data of 50 patients with chronic osteomyelitis. * Period of 48 hours before surgery, excluding surgical prophylaxis (two doses maximum). The source of the cultured samples, discriminated as bone and non-bone specimens, is detailed in Table 2. Bone biopsy was available from 76% of patients, sequestrum from 20%, bone marrow from 2%, and subperiostic pus from 2%. For non-bone specimens, soft tissues surrounding the infected bone were most common (60%), followed by surgical wounds (22%), sinus tracts (10%), pus secreted through pins orifices (4%), and pus aspirated from soft tissues surrounding the infected bone (4%). Description of bone and non-bone specimens from 50 patients with chronic osteomyelitis. Figure 1 illustrates the etiology of COM in these 50 patients, based on bacterial species isolated from bone specimens. Staphylococcus aureus was the most prevalent organism (42% of the patients), followed by Gram-negative bacilli from the Enterobacteriaceae family (22%), Enterococcus faecalis (18%), Pseudomonas aeruginosa (16%), Acinetobacter calcoaceticus-baumannii complex (10%), coagulase-negative Staphylococcus (10%), Streptococcus spp. (10%), and others (14%). The total percentage is greater than 100 because 18 patients (36%) had polymicrobial COM. 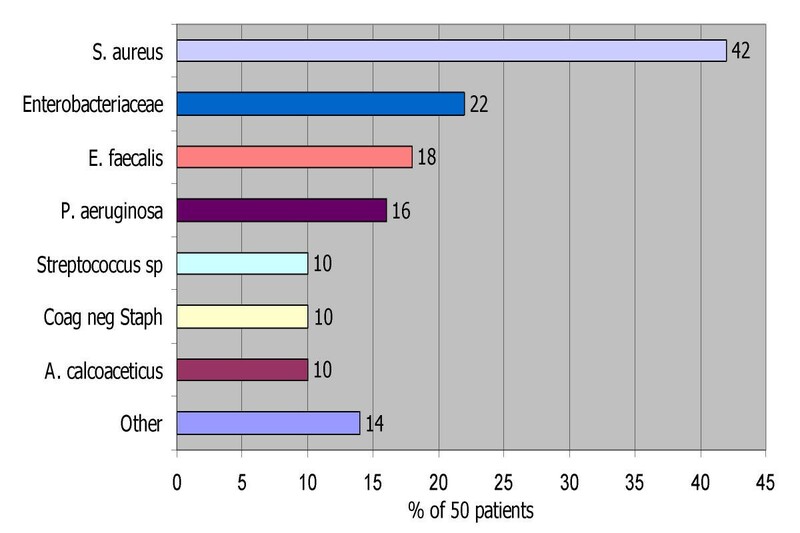 Percent distribution of bacterial species isolated from the bones of 50 patients with chronic osteomyelitis. Concordance analysis for 50 patients and their 100 cultures is shown in Table 3. Cultures from bone and non-bone specimens produced 68 and 57 bacterial isolates, respectively. Bone and non-bone specimens were sterile for 3 and 7 patients, respectively (only 1 patient had sterile cultures from both specimens). Both specimens grew the same genera and species in 20 patients (40%), but 6 had divergent susceptibility patterns, demonstrating different strains of the same species. Thus, concordance between bone and non-bone specimens was 28% (14 of 50 patients). Cultures from non-bone specimens missed 35 bone isolates in 26 patients (52% false negative rate), and grew 23 isolates not present in the infected bone of 18 patients (36% false positive rate). Staphylococcus aureus was isolated from the infected bone in 21 patients (Table 4); 4 of them (19%) did not have S. aureus in non-bone specimens, and only 8 (38%) matched exactly with non-bone cultures. On the other hand, S. aureus was isolated from 20 non-bone specimens, 14 in monomicrobial and 6 in polymicrobial cultures. Looking at S. aureus in monomicrobial and polymicrobial COM, non-bone specimens were concordant with bone specimens in 7 (50%) and 1 patient (17%), respectively. Excluding COM caused by S. aureus, concordance was 19% (5 of 26 patients). Concordance analysis between bone and non-bone specimens for 21 patients with chronic osteomyelitis by Staphylococcus aureus. Sequestra were cultured as bone specimens in 10 patients, 3 cultures were monomicrobial and 7 polymicrobial. S. aureus was isolated in 5 cases, 2 in pure culture and 3 with some other pathogen. Non-bone specimens were concordant with sequestra in 3 of these 10 patients (30%). Drainage from sinus tracts was cultured as non-bone specimens in 5 of 50 patients; one was concordant with bone specimens (20%). The surgical access was well described for all patients. Bone was accessed through healthy skin in 12 patients and through infected soft tissues in 38 patients; 50% and 32% bone cultures were polymicrobial in the first and second group, respectively (p = 0.6469). Twenty-six patients (52%) were on 1 to 3 intravenous antibiotics at the time of bone biopsy; bone isolates were resistant to the antimicrobials given in 14. Twenty-four patients (48%) did not have antibiotic therapy; bone isolates displayed unexpected resistance in 10 (p = 0.5633). Length of exposure ranged from 2 to 70 days, mean 23 ± 19 days; 15 and 11 patients were exposed to antibiotics shorter and longer than 21 days, respectively. Bone isolates were resistant in 8 of the first and 6 of the second group (p = 0.7362). Antimicrobial therapy did not affect concordance between bone and non-bone specimens: 4 patients (15%) with and 10 (42%) without antibiotics had concordant cultures (p = 0.0797). Most experts agree that COM is actually a curable disease provided that thorough surgical debridement is done, osteosynthesis material is removed, and appropriate parenteral antimicrobial therapy is instituted for at least 4–6 weeks [4, 5]. Particularly in victims of trauma, COM may require antimicrobial therapy for months to years, sometimes with antibiotics that are invaluable for the hospital environment, such as glycopeptides and carbapenems. This situation makes the accurate identification of the pathogen an absolute cornerstone of antimicrobial therapy. To prescribe any unnecessary antibiotic, or to leave untreated any pathogen infecting the bone, would have serious epidemiological and clinical consequences, in terms of resistance, other secondary effects, diverse medical complications, repeated therapeutic failures (no cure), and sequelae. Thus, a clear understanding on selecting the best specimen for microbiological diagnosis is mandatory. Mackowiak et al established bone specimen cultures as the gold standard for microbiological diagnosis of COM in 1978 . In a well-done retrospective analysis of sinus-tract and bone cultures of 40 patients, they concluded that only bone specimens were reliable to identify the etiology of COM. Approaching the same problem with different definitions, recent studies have reached the opposite conclusion. Between 1991 and 1997, three papers about microbiological concordance between bone and non-bone specimens were published, accounting for 145 patients with osteomyelitis [6–8]. Cultures were concordant in 47–62% of patients, and one study reported 89% sensitivity and 96% specificity for non-bone specimens . With slight variations, these papers concluded that non-bone specimens are appropriate to establish the etiology of COM. However, major methodological flaws affect the validity of their conclusions. First, acute and chronic osteomyelitis were often mixed in unknown proportions. This consideration is important because the dynamics of bacterial populations in soft tissues and bone differ greatly over time . Second, debridement material – instead of bone cultures– were used as the diagnostic gold standard to compare cultures from wound swabs and sinus tracts. Third, needle bone biopsies were taken through the sinus tract, usually two weeks before debridement. Such procedure has the risk of introducing organisms that could be recovered during debridement two weeks later. Fourth, all kind of tissues removed by surgical debridement were considered good diagnostic specimens. This assumption is incorrect because soft tissues exposed to the environment are easily and rapidly colonized by non-invading flora. Fifth, susceptibility patterns were not considered. After eliminating most of these confusion factors, we found only 28% concordance between non-bone and bone specimens. In other words, antimicrobial therapy guided by antibiograms of bacteria isolated from non-bone specimens would be inappropriate in 72% of the patients with COM. More specifically, antibiotic prescriptions would be unnecessary in 36% and insufficient in 52% of the patients. There are similarities and differences between this study and that reported by Mackowiak et al . General concordance values were very low in both studies (28 and 22%, respectively), and concordance for COM caused by pathogens other than S. aureus was also insignificant (19% and 8–29%, respectively). We found three times more cases of polymicrobial COM (36% versus 12%), probably reflecting the high frequency of trauma (84%). An important difference is concordance for S. aureus COM, which we found to be much lower (38% versus 78%). This is explained by our stricter definition of concordance, which required complete matching between both specimens. Concordance was also very low for other comparisons between specimens: sequestra versus non-bone specimens (30%), bone versus sinus tracts (20%), and bone versus surgical wounds (20%). These data indicate that microbiology of bone specimens in COM is usually different to that of any other tissue, even if it surrounds the infected bone. Three patients with history and images of COM had sterile bone cultures, one also had sterile non-bone cultures. Two of them were on antibiotics before specimen sampling. Prospective following with aerobic and anaerobic bone cultures demonstrated S. aureus in the first, A. calcoaceticus-baumannii complex in the second, and Propionibacterium acnes in the third patient. The retrospective design of this study prevented control for variables as important as the use of antibiotics at the time of sampling, the process to take uncontaminated specimens, and the quality of the microbiology. COM secondary to diabetic foot infections and decubitus ulcers were excluded because the value of bone cultures is clear in the first  and uncertain in the second condition . The important role of anaerobic bacteria and the prolonged exposure of bone to environmental flora prevent a judicious analysis of these conditions in the same group with posttraumatic and hematogenous COM, particularly when anaerobes are not accounted for (this case). Accessing the bone through infected soft tissues was not associated with polymicrobial bone cultures more often than the access through healthy skin. This finding was unexpected, as polymicrobial colonization of soft tissues is common in patients with COM associated to trauma and bone contamination is facilitated by concomitant manipulation of colonized soft tissues [15, 16]. It might be explained by the high rate of trauma (84%) and polymicrobial COM (36%), and the fact that bone was accessed through infected soft tissues in the majority of our patients (76%). Use of antibiotics before specimen sampling did not appear to affect patterns of susceptibility or concordance between bone and non-bone specimens. However, the number of patients is small to find significant differences, and a prospective analysis would be a better tool to overcome this and other limitations mentioned before. In conclusion, non-bone specimens should not be used for guiding antibiotic therapy in patients with chronic osteomyelitis caused by S. aureus or any other bacteria. To do that would cause an unacceptable high rate of therapeutic mistakes. Culture of bone specimens obtained by clean operative procedures remains the gold standard diagnostic test. AFZ participated in the collection of data from clinical records, carried out the database management and drafted the manuscript. WG participated in the collection of data from clinical records and carried out the literature search. FJ participated in the design of the study and performed the statistical analysis. OV conceived of the study, participated in its design and coordination, and wrote the paper. All authors read and approved the final manuscript.